I realize that knitting a gauge swatch may not be your favorite thing in the world. But sometimes you do need to get gauge before starting a project. What if I told you that you can get gauge without having to do math? No multiplying, no dividing, and no guessing. Would that make it better? We’ll use that to make our swatch. Unless it says otherwise, assume that the gauge is for stockinette. 2) Then cast on 4 more. 3) Knit 4 rows. We’re making a garter stitch border here. Repeat these two rows until you have worked the number of rows that should get you four inches tall. In our example its 24 rows. 5) Knit 4 more rows and bind off. 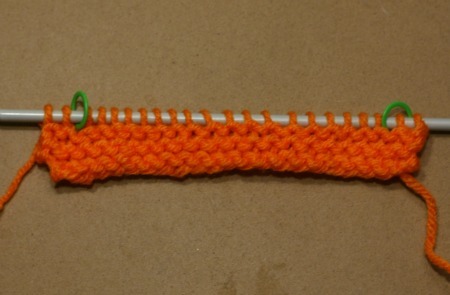 Yeah, you really should bind off. It makes for more accurate measuring. But you don’t have to cut… if that helps. 6) Let’s measure. You’ll want to measure both the width (number of stitches) and the height (number of rows) INSIDE that garter stitch border. 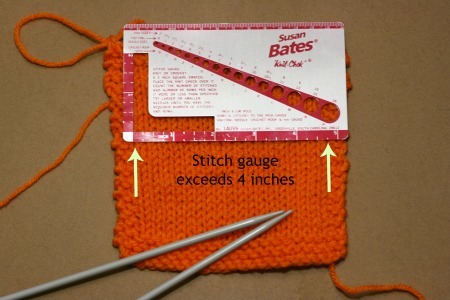 If you got gauge, the stockinette section of your swatch will be 4 inches x 4 inches. Mine is not. It’s bigger than 4 inches in both directions. So I have to try a smaller needle. If this swatch was less than a 4 x 4 inch square, I’d have to try a bigger needle. I got gauge! Size 5’s are what I would need (with this yarn) to get gauge on my project. And I didn’t have to reach for a calculator or scribble out a quick multiplication/long division problem on scratch paper. The next time you need to get gauge, try this method. It works every time. 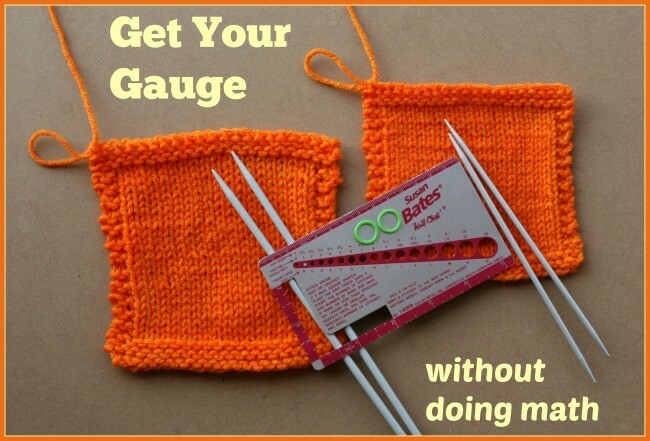 Your knit gauge is different than your purl gauge. 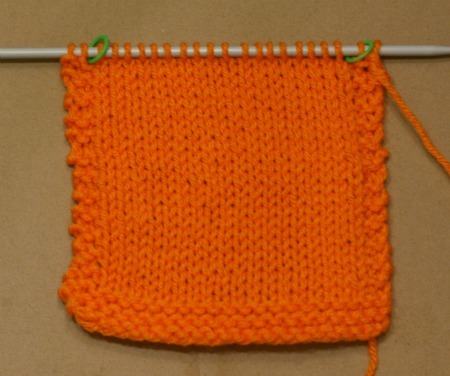 That is, when you make a knit stitch on the Right Side you are holding the yarn at one tension and when you purl on the Wrong Side you are holding at a different tension. If your stockinette looks bubbly, then you have this issue. You could try to train yourself to be more consistent or… you could use a different size needle when you work that Wrong Side. Shrug. Problem fixed! The other cause is you didn’t really get gauge. If you have 4 inches wide but less than 4 inches tall, you are not a gauge yet. But you are close. Keep in mind that stitches can be stretched in either direction. 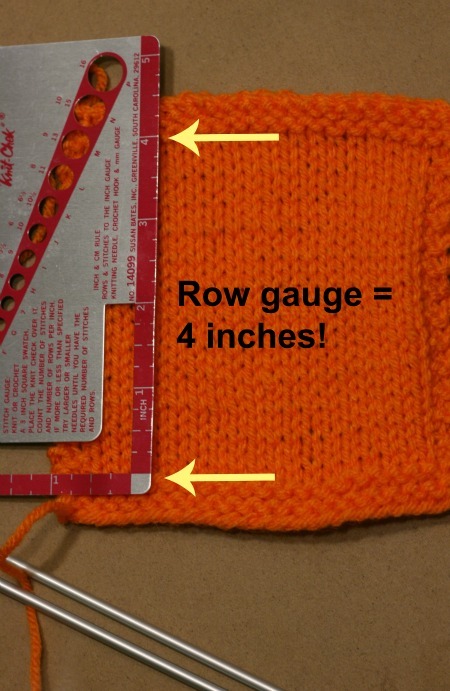 So if you were to take your swatch (or sweater or glove or sock) and stretch it length-wise to get that 4 inches, it would loose some of its width. 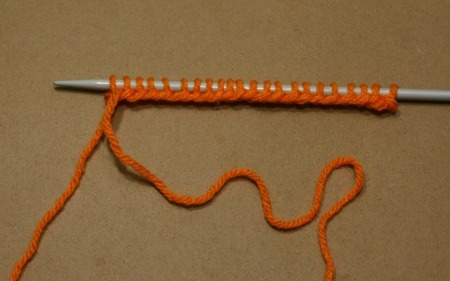 This is usually what’s going on with a project that doesn’t fit right even though the knitter “got gauge”. They didn’t. 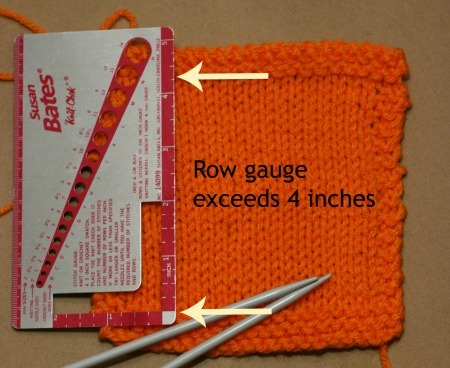 The gauge needs to be right for both stitch count and row count and don’t hate me for making this point. Its just the way yarn acts when its knitted. 12 Comments on "Get Gauge. No math." The pattern people lose me right off the bat when I read things like 24 rows!! 4 inches!! No way I’m doing that. Why not 12 rows 2 inches? Why is that not good enough? Lol. If I had said, in this post, take that 4 inches and divide in have… take the number of stitches and divide that in half, I would have been doing math! And that is what I was trying to avoid. As for why the pattern designers use 4 inches as a standard, I’m not certain. It is a good size that works for small and bulky yarns. Its big enough to let you see how a variegated yarn will work up. Shrug. But if you want to do 2 inches, go for it! I thought about recommending the washing of gauge swathches but I didn’t want to push it. If I have a high-stakes-knitting project (like a sweater) I’ll measure gauge dry and then wash/block and see if it changes. Some fibers will change a lot after a first wash! Cotton, bamboo, alpaca are all big on my suspect list. But I recently had a friend tell me that my OCD was showing. lol So I’ll stop there. I cheat.. I have one of these and I love it! 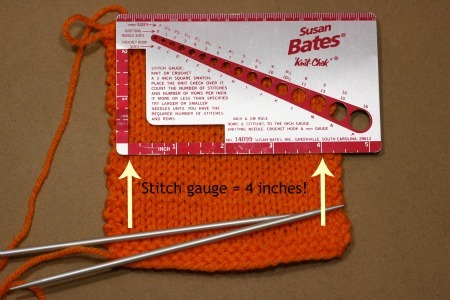 http://www.amazon.com/Boye-7526-Count-Plastic-Gauge/dp/B00KKV8JVQ I cast on 14 stitches then work 10 rows and check. If that doesn’t work I switch bigger (or smaller) knit another 10 and check again. So far it’s worked really well for me. You are a big cheater! Like that about you. I think we all hate taking the time to swatch for gauge especially when we’re anxious to start a new project. I am a loose knitter so I always try 2 needle sizes smaller. Usually that works and I will check my knits as I work to make sure. But for yarns I’m new to I better swatch first. Been doing it this way for years, just because I found it easier to measure the swatch than the other way but really its easier all round. Thank you. Ahh, then you didn’t need me! It is easier to see if that many stitches/rows comes out to 4 inches than to go counting stitches/rows per inch. More accurate too.